SPARKLY LADIES! : TUESDAY'S JEWELRY SPOTLIGHT "Elegance by Elaine"
TUESDAY'S JEWELRY SPOTLIGHT "Elegance by Elaine"
TUESDAY'S JEWELRY SPOTLIGHT is featuring "Elegance by Elaine"
Hi everyone. I'm a stay at home mom and have been for years. I live in a house where I am the only female! I have 4 sons who have recently graduated college (yahoo) and are looking for full time jobs, who live at home, along with my husband. So you can see why I love making jewelry with all the pretty colors, sparkle and designs, when I can find the time. I love the colors and shapes of different beaded jewelry which allows me to create various patterns of design. My absolute favorite is the Swarovksi crystal with its absolutely incredible shine factor. Weaving creations of crystal is time consuming, but worth the final effect. 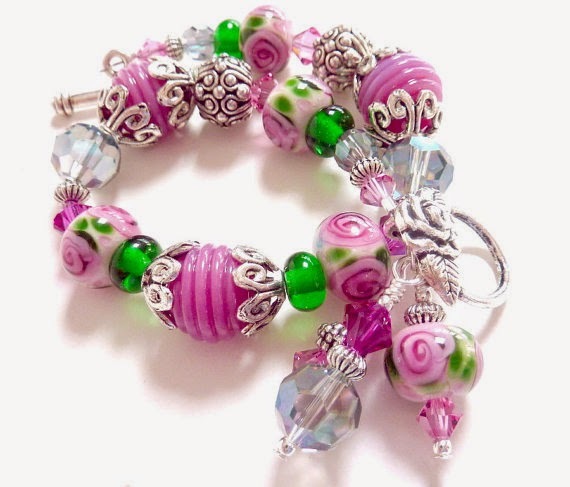 Handmade lampwork beads are also a favorite of mine! I have expanded from just jewelry making to add gift items made with glass lampwork beads as well. Glass beaded pens, bottle stoppers, key chains, letter openers and other goodies. I also sell handmade pens turned on a lathe. Some of these are various types of wood, while others are acrylic colored blanks. These pens are made by my sons who were taught by their grandfather (my father). I also have some pens made by my father on my site. And my pens are the glass beaded ones. All are beautiful and unique. I am adding more glass lampwork beaded earrings to my shop as weaving produces lovely work but is so time consuming. Please check out my store for various gift ideas. Thank you.